Happy Saturday! Well, I'm the hostess this week over @ Our Creative Corner. I really do like being the hostess. I love creating a challenge for everyone to participate in. I think that if the challenge makes you think, take inventory as to what you have on hand, and/or use products/colors that have been neglected, then it is a good challenge. So, this weeks challenge is to use a 'number' in your paper craft item. Sounds easy, huh? I think it sounds fun! To help me get my creative juices flowing, I selected the current layout from Mojo Monday #207. I also needed a little more guidance, so I selected the color challenge from Shabby Tea Room #80: white/cream, kraft, and brown/black. I really liked that both the sketch and the inspiration photo had oval frames in them. 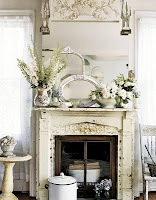 I also loved the various flowers and all the white-wash-ness in the inspiration photo. For the OCC challenge, I used 'No. 5'. Now, 5 doesn't mean anything to me, except that's my oldest granddaughter's age. But, I just LOVE the font! It's so pretty and elegant. Lately, I have been on a scrap kick. I have been using scraps to create my cards. I know, that sounds aweful. But, you should see the size of my scrap box! The card uses 75%/+ stampin' up!. The card base is Crumb Cake card stock. The black matts are Basic Black card stock. I used Very Vanilla card stock and the new frame embossing folder. I stamped the 'No. 5' in Basic Black classic ink. I used First Edition DSP to create the rolled flower. I used a small piece of Beau Chateau to make the leaves. So the kraft polka dot and black/cream pattern paper I have used before. But, at this point I don't remember who makes either paper. The brown crochet trim is a scrap piece, and I attached that to the card with a staple. I added a wooden button. I tied some linen thread to the wooden button and added a faux half pearl. The multi-loop bow is made with Vanilla seam binding. I held it together with a vintage brad. Thank you for stopping by, and I hope that you have a chance to play along with us this week! Wow this is so pretty. I love how you used so many layers with so much texture. Thanks for including this in this week's challenge in the Tea Room. 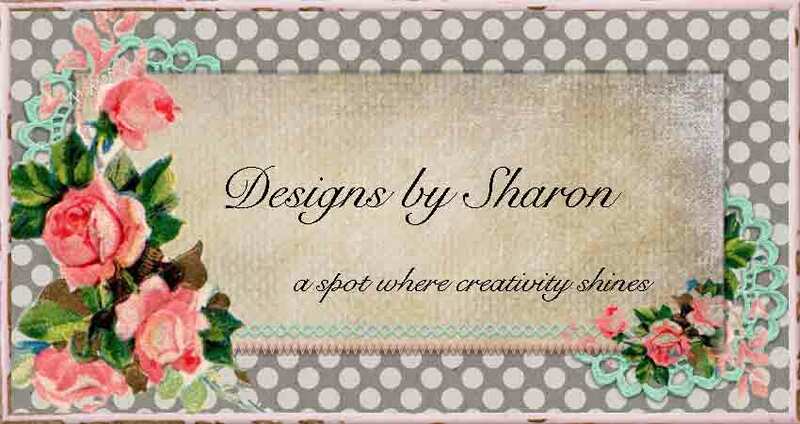 Beautiful card, Sharon! Love the No 5 and those two gorgeous and very different handmade flowers. A great take on the sketch and inspiration photo! So sorry I didn't have time to make a card for this challenge. I had one all sketched out and everything too- it just never got made :( Hope you have an awesome week! What a lovely card, Sharon. The vintage palette is so warm and inviting and I love the rolled paper flower and the scrap of lace you used! What a fun challenge this was - great job! Oh my Sharon ... 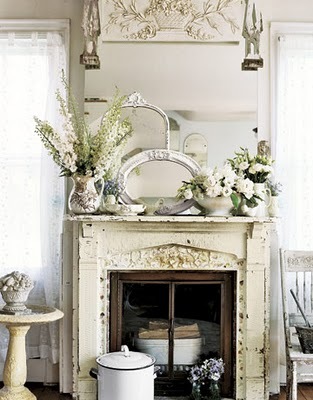 I think this is a beautiful take on the inspiration pic - love the soft neutral tones with your layers and textures! Beautiful and elegant .... awesome work! 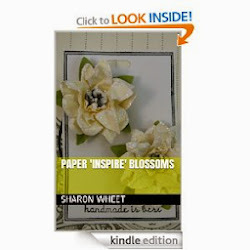 This is really pretty, Sharon - I love how you used the sketch and inspiration challenges. Beautiful soft colors and embellishments - just gorgeous! Thanks for two fun challenges!